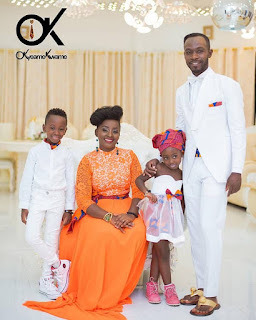 They may be actively involved in showbiz activities but that has not drifted the attention of Okyeame Kwame's children from education. While the Rap Dacta and his wife are helping nurture the creative talents of their kids Sir Bota and Sante Antwiwaa, they have also put in place concrete measures to ensure they receive the best of education that would give them a better future. In an interview with Graphic Showbiz recently, the wife of the celebrated rapper, Annica Nsia-Apau who also doubles as his manager revealed that their children attend three different schools - a move to give them a solid foundation. “My children go to three schools; they do their regular school from morning to 3pm, they do long distance online homeschooling by a group of Harvard and MIIT graduates and then they have an in-house teacher who takes them from Friday to Sunday. I think that's a good start for children who are nine and seven years old,” she said. Annica indicated that aside giving the children quality education, they are also concerned about nurturing their talents, a reason they are involved in some showbiz activities. “The least we can do for them is get them to pursue things they love. So whatever they love that doesn't go against the laws, by God, we will work at making it happen,” Annica added. Sir Bota and Sante were first seen on the music scene when they were featured in 'Saucing', a song by their father, Okyeame Kwame. A few months ago, they released another song titled 'Read', for a project spearheaded by Worldreader, an NGO, in collaboration with Amazon and Ministry of Education.Sante has also launched her own hairpiece line known as Sante’s Hair for Kids. According to Annica, they do not impose anything on the kids. They come up with their own ideas and then she, together with Okyeame Kwame, refine them. She explained that one reason they support their children to venture into fields of their interest is to teach them healthy risk taking. “As parents, we are not looking at the stereotypical lives for our children. We are looking at their talents and nurturing them. So whatever they show interest in that is legal and builds them up, that's what we will drive,” she said. “I don't want them coming to us for money when they are aged 20, they should earn their keep. So we keep researching with them on how to make their own money legally, how to build a business, how to become financially independent, how to save etc,” Annica added. Annica in different interview further asked if people would have complained if they were lawyers or doctors who took their children to their work places to understudy them. She said even in the Bible, Jesus Christ understudied his father Joseph who was a carpenter so there is nothing wrong introducing their children to their work. With regards to opening social media handles for them, she explained that they want to give the children a head start. "By 18 we want them to have 18 million followers. When they grow and they like it, we have given them a head start. It's like opening a bank account for them. But then when they grow and they don't like it, they should turn it off. It doesn't take much to turn a social media handle off, " Annica noted. She advised parents to allow their children to take part in extra-curricular activities, stating that in the next 10 years it will take more than just passing exams to enter into a university. Okyeame Kwame's family has been touted one of the most adorable among Ghanaian celebrities.